There is an oft-quoted story that has to do with the origin of the upright (peloric) flowers that are so closely associated with the familiar cultivated forms of S. speciosa. Prior to 1845, all plants of S. speciosa in cultivation had flowers that were basically wild type in form; the corollas were nodding, had five petal lobes, and had a single plane of symmetry. These are termed “zygomorphic”. In that year, John Fyfe (or Fyffe), a Scottish gardener, grew a plant that had fully upright flowers with radial symmetry. Such flowers are described as being “actinomorphic” (raylike or radiate in form), because they have multiple planes of symmetry. At this time, Fyfe was the head gardener on the estate of Thomas D. Douglas, a prominent citizen in Rothesay, the county town on the Isle of Bute. He apparently left no written record about the origins of his plant, which soon became known as Gloxinia Fyfiana. Joseph Harrison, writing in The Floricultural Cabinet of March of 1847 (which included a colored illustration), speculated that one parent of G. Fyfiana must have been G. maxima because of the similarities in flower color and size. Although Harrison’s opinion was restated many times in print well into the late 19th century, the matter was never really resolved. A diligent internet search turned up an obscure article from The Gardener’s Monthly and Horticulturist of December 1879 by a ‘Mr. Fyfe, Mt. Auburn, Mass’ who turned out to be the John Fyfe of gloxinia fame (he and several of his children had emigrated to the US in the 1870s, and he died in Holyoke, MA in 1882). Gloxinia Fyfiana was the name given plants with the upright and peloric flower characteristic of many modern hybrids. The publication by Harrison in The Botanical Cabinet, to the left, was the first representation of these, although later illustrations such as that from Van Houtte (1848) were of better quality. Writing 35 years after he saved the seed that gave us G. Fyfiana, Fyfe described his plant and provided tips on the cultivation, propagation, and diseases, etc. of gloxinias, but he also discussed the origins of G. Fyfiana. He confirmed that the seed parent was indeed S. speciosa, but he did not name any particular cultivar, and his account only perpetuates the confusion because of the following baffling statement; “… the parent plant of Gloxinia Fyfiana was profusely dusted with the pollen of Digitalis purpurea (foxglove), Lophospermum scandens, Datura wrightii, [and] Brugmansia sanguinea”. The one thing that these species share with S. speciosa is that all four are in the botanical order Lamiales, but none of them are classified in the family Gesneriaceae. The deep phylogenetic distances between the Gesneriaceae and both the Solanaceae (Datura and Brugmansia) and Scrophulariaceae (Digitalis and Lophospermum) make this parentage extremely unlikely, so we may never know the true origins of G. Fyfiana. Mr. Fyfe’s article ends on a somewhat humorous note with the tale of a theft similar to that of Gloxina rubra some years earlier. Fyfe had exhibited a large plant of G. Fyfiana at a meeting of the Dunoon Horticultural Society, and he left it in the care of others when he was called away to officiate as a judge. He returned a few hours later to find that some leaves had been stolen. Later that year, plants were being sold “ for a sovereign each … by some of the London Nurserymen.” This sounds like a lot of money to spend on a houseplant at that time; a sovereign was equal to £1 sterling, and according to an online money converter (moneysorter.co.uk), this is equivalent to £72.53 ($95 US) today. A list of “New, Rare, and Choice Stove Plants” available from the nursery of Messrs. Henderson, Pine Apple Place, London, offered plants of G. Fyfiana for 3s6d in 1850 (around $22 today). G. Fyfiana was a very popular plant in its time, and the 19th century botanical literature is full of references to it being displayed in regional horticultural shows throughout the United Kingdom. There is even a record of “our old friend, G. Fyfiana” being shown at a meeting of the Pennsylvania Horticultural Society in 1855 (Horticulturist and Journal of Rural Art and Rural Taste, vol. 5, 342). Mr. Fyfe’s Gloxinia had a profound and lasting effect on S. speciosa as a horticultural crop, and it is quite possible that all of the cultivars with peloric flowers are descended from G. Fyfiana. 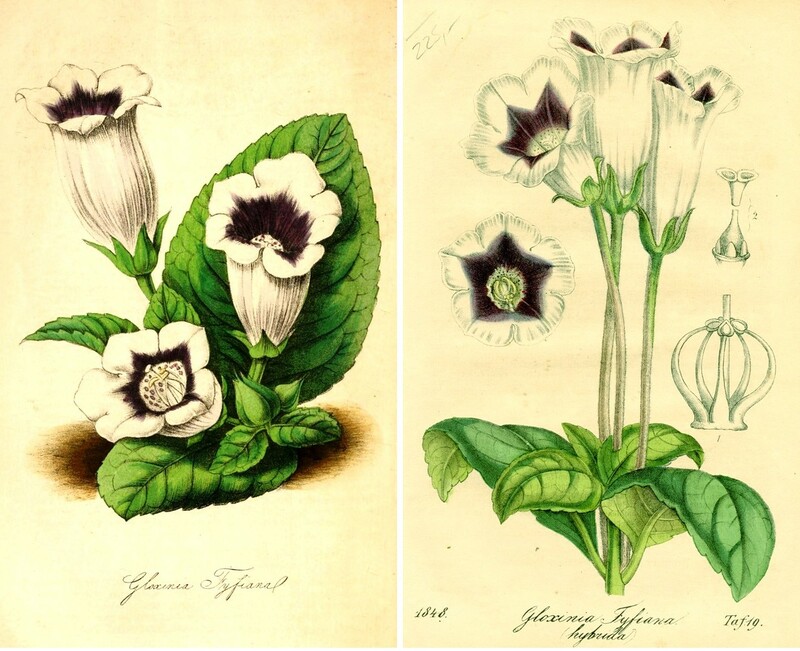 In the 19th century, commercial nurserymen such as Mr. Haage of Erfurt (Germany), successfully incorporated the upright flower trait into improved ‘gloxinia’ cultivars by crossing established varieties with ‘Fyfiana’. In Belgium, the Établissement Horticole de Louis Van Houtte was very active in breeding and releasing named peloric cultivars, and this is reflected in the pages of several Belgian periodicals well into the 1870s. The first known image of a peloric hybrid of S. speciosa is that of ‘Princess de Prusse’ (with red and white flowers) from L’Illustration Horticole in 1854. 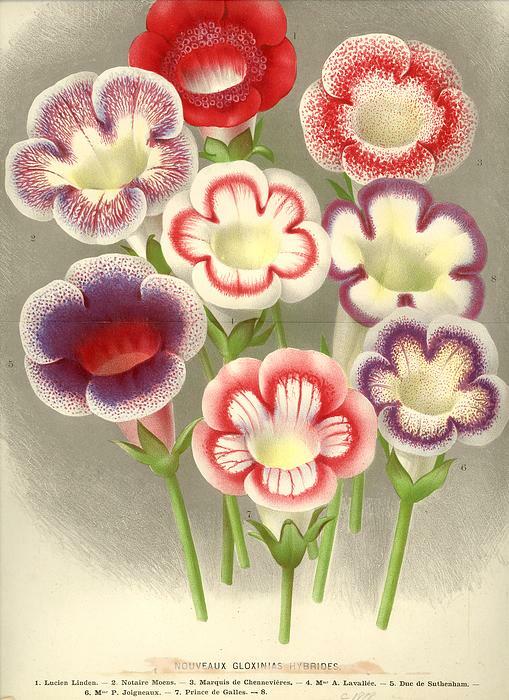 From this time until around 1895, we find a wide diversity of new commercial varieties being illustrated, many with proper cultivar names such as ‘Don Pedro V’ (pink and white), ‘Fulgens’ (red and white), ‘Lady Grosvenor’ (purple and white), ‘Fairy’ (pink and white), ‘Helen of Orleans’ (purple and white), and ‘Cordon Lavande’ (white with lavender border). Plants of this type proved to be extremely popular with the public, and by the end of the 19th century they had all but displaced the earlier forms with nodding flowers. To illustrate this, out of 37 named varieties grown for evaluation in the trials at Chiswick (west London, England) in 1862, 17 (46%) had erect flowers; by 1878, this number had grown to 78% (59 out of 76) at these same trials (Moore, T. Proceedings of the Royal Horticultural Society, London, vol. 3. 1863; Barron, A.F. Proceedings of the Royal Horticultural Society, London, vol. 5. 1879). The lists of cultivars in these two references provide brief descriptions of the plants as well as the name of the originator, and give us a sense of what was current at that time. 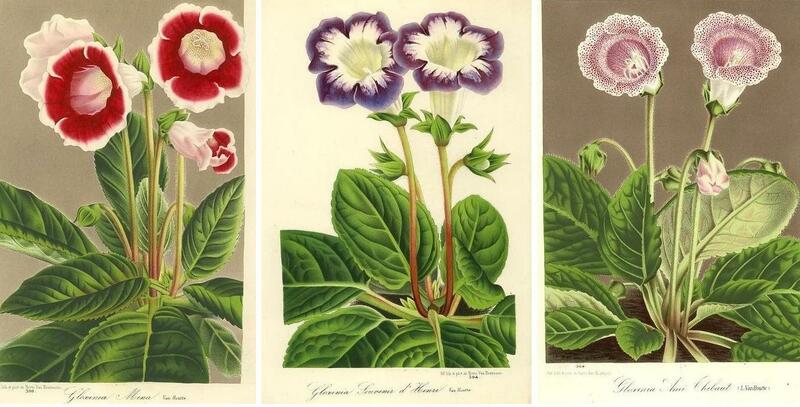 Gloxinia hybrids, from left ‘Mina’, ‘Souvenir d’Henri’ and ‘Ami Thibault’. Van Houtte, 1865-75. In African Violets, Gloxinias, and Their Relatives, Hal Moore established three groups or ‘convarieties’ within S. speciosa based on flower type: speciosa, maxima, and Fyfiana (Moore 1957; page 312). He included all of the peloric cultivars in the ‘Fyfiana Group’, a taxonomic designation that is still occasionally encountered today.